This image is not one that is currently in the gallery, but is another image from my trip to the central coast of California in June of 2010. One of my favorite subjects for my photography has always been unique patterns, textures, and color, and this image fits that bill perfectly. It is also an image that allows me to continue with similar advice that I gave in the article of my last featured image, Transparent Leaves, which was to always be ready to shoot. I am going to continue along those lines, but this time talk about being aware of everything that is going on around you. While you are capturing that wonderful sunset in front of you there may just be another amazing shot waiting to be captured behind you, or maybe to your left or right. Capturing this image is a perfect example of that. On this day, we left San Simeon, bright and early to photograph the elephant seals at the Piedras Blancas elephant seal rookery just a few miles north of San Simeon. After photography the seals, we heading south to Cambria for breakfast, followed by a short excursion to Harmony California. But the real excitement for me on this day was that we would be having lunch in Montana de Oro state park, known to have some very nice tidal pools. I was really looking forward to photographing the amazing sea creatures that would be found in these pools. However, this was not to be. Upon our arrival to the park, we found that we had arrived at high tide with a good strong surf battering the coast line. A mild disappointed for sure but the views of the coast line and the ocean were still amazing, leaving plenty to photograph. Before having lunch at the picnic area above Spooners Cove, I ventured down to the beach for a few quick shots of the cliffs to south and the rock formations to the north of the cove. The geology of this area is composed mostly of Monterey Shale which juts up from the ground in various angles and extends out into the ocean almost like natural piers. I situated myself on a rock that allowed me a view of the surf rolling in between a large rock formation to my left and a lower but longer formation on my right that extended out into the ocean. I was actually out past the shore line and about 4 feet above the water. The surf was coming in past my location on both the left and right. I got busy capturing images of the surf coming in between the two rock formations, trying to catch the various ways the surf crashed against the rocks. I was capturing some nice snapshots but nothing with that wow factor a really good image can have. 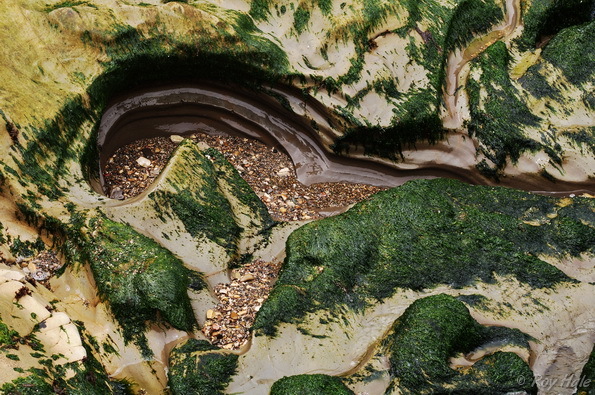 When I just by chance happened to look down directly to my left and saw the surf receding and leaving this amazing scene of green seaweed and rock. The pounding of the surf in this area over time had carved this magnificent tiny canyon in the rock right below where I was sitting. I immediately knew that I had an image I would enjoy. I only took a couple of shots, both with the surf and without, but looking at my LCD I knew I had a keeper in letting the surf completely recede and relying on the just the color, textures, and patterns left by the wet rock and seaweed. So remember, once you are at a great location be aware of all that is going on around you. While capturing that great image in front of you others may be lurking behind you, or in my case, virtually right at your feet.